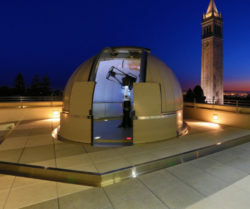 Astro Night is UC Berkeley’s free stargazing and lecture event open to the public. Held typically on the first Thursday of the month (during select months, as weather permits), members of the public are invited to take part in guided stargazings using our fleet of telescopes, including their 17-inch telescope located in their roof-top observatory, in addition to attending a lecture from one of their many researchers. Members of their department will be on hand to answer your questions and tell you more about the going-ons in Campbell Hall. Event Date & Stargazing Details May Change: Stargazing is dependent on weather conditions; lectures will always occur as scheduled. Below is the current Astro Night schedule; more dates to be added; abstracts are linked in the talk titles.